It is Friday, December 3, 2010 and I am standing in the Safeway checkout line scanning the magazines again. I did not make this up, by the way. People and the Globe are side-by-side on the rack. 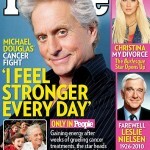 Both have cover articles with pictures of Michael Douglas. People has a picture of him smiling and looking healthy and saying he is getting stronger every day. 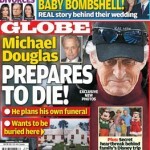 The Globe has him looking like death itself and saying he is planning his funeral.